It is not new to the world that gadgets comes after gadgets. They always find ways to spend your money. 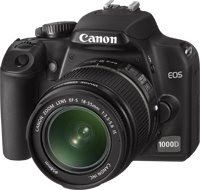 Like this time, Canon just launched their newest DLSR model and it is the new Canon 1000D. Based on the picture I can't see any difference at all but perhaps all the functions and speed lights will be more fancy compare to the old models. But hey, I have to wait another year before I can upgrade and on that time I'll sure there will be newer model and better. But for now, this is one of the best DLSR to buy.